BANKGOK (ESCAP News) — Heads of government, ministers and other high-level officials from 50 countries and territories in Asia and the Pacific endorsed the Report of the Asia-Pacific Intergovernmental Meeting on HIV and AIDS, along with the Regional framework for action on HIV and AIDS beyond 2015 at the 71st session of the United Nations Economic and Social Commission for Asia and the Pacific (ESCAP). 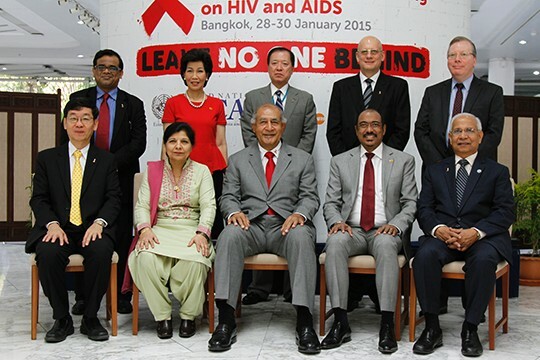 Several ESCAP member States emphasized that the Regional Framework for Action on HIV and AIDS beyond 2015 was a useful tool for guiding national efforts towards accelerating action and investment in the HIV response to end AIDS as a public health threat by 2030. However, if the region is to reach that goal, the pace of progress needs to quicken. The next five years are crucial. UNAIDS has set new Fast-Track targets, which include reducing the number of new HIV infections in the region to 79 000 by 2020 from 350 000 in 2013. It is possible to reach this ambitious goal if countries follow the actions outlined in the report and regional framework. The Prime Minister of Thailand inaugurated the Ministerial segment of the Commission, which was held in Bangkok from 25 to 29 May 2015, and was attended by the Presidents of Kiribati, the Marshall Islands and Nauru; as well as the Prime Ministers of Fiji, Tuvalu and the Cook Islands. The session came just months before the United Nations will adopt a new agenda to promote sustainable development for the period after 2015. The regional framework will be an important input to the global review of progress on development goals. The new framework identifies three areas of action. The first area is supported by ESCAP and focuses on continuing national reviews and consultations to address legal and policy barriers for ensuring universal access to HIV prevention, treatment, care and support. The second area calls for national reviews and consultations on ensuring access to affordable drugs and medicines. The third area promotes the development of national HIV investment cases and plans to ensure sustainable financing of the AIDS response. Almost 5 million people are living with HIV in Asia and the Pacific. New HIV infections have declined since 2001 and more than 1.6 million people were receiving antiretroviral treatment by June 2014.